Termites generally don't elicit a whole lot of love. But surprisingly, this wood-eating insect may hold the key to transforming coal—a big polluting chunk of the global energy supply—into cleaner energy for the world, according to University of Delaware researchers. In the American Chemical Society journal Energy and Fuels, UD Professor Prasad Dhurjati and his research team describe in detail how a community of termite-gut microbes converts coal into methane, the chief ingredient in natural gas. The study, which produced computer models of the step-by-step biochemical process, was a collaboration with ARCTECH, a company based in Centerville, Virginia, that has been working with these microbes for the past 30 years. ARCTECH provided the UD team with the experimental data that was used to validate the models. 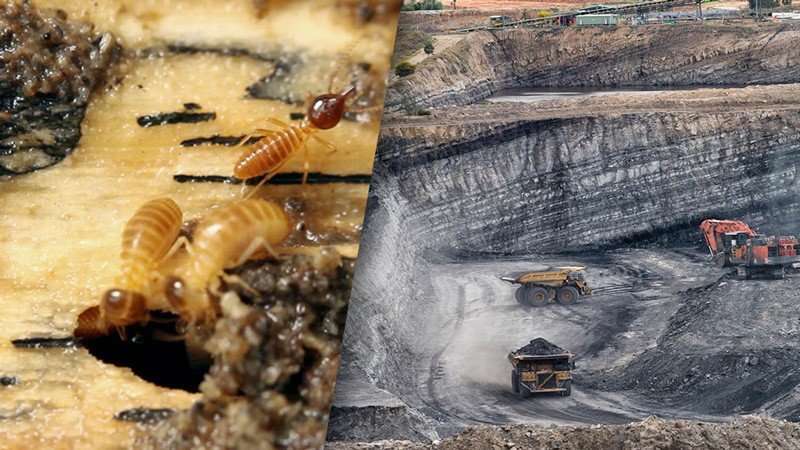 "It may sound crazy at first—termite-gut microbes eating coal—but think about what coal is. It's basically wood that's been cooked for 300 million years," said Dhurjati, who is on the faculty of UD's Department of Chemical and Biomolecular Engineering. Eons ago, trees and other plants from the huge forests that once covered the Earth died and fell into swamps. Layers upon layers of this vegetation were subjected to high pressure and temperature from geologic forces, forming seams of coal. Anthracite is the hardest, cleanest burning coal, followed by bituminous, sub-bituminous and lignite coal. Now, consider the termite (of which there are about 3,000 different species around the globe). According to the National Pest Management Association, termites cause more than $5 billion in property damage each year. They can eat wood and extract energy from it, thanks to a few thousand microbes living inside their gut. This dense community of microscopic organisms works together to digest the cellulose and lignin that give plant cell walls their rigidity. These same microbes can digest coal, releasing methane and producing humic matter, a beneficial organic fertilizer, as a byproduct. Each microbe contributes to one or more steps in this intricate digestion process, in which there are hundreds of steps, and where the product of one microbe may serve as food for the next. "These microbes make millions of surgical nicks in the coal, using enzymes derived from a vast array of genes," Dhurjati said. Several companies have attempted to commercialize on this microbial breakdown of coal, but have failed because of the complexity involved in making a community of microbes work together. However, ARCTECH has succeeded in getting the microbes to convert coal into methane gas, as well as organic humic products useful for agriculture, water cleanup and waste recycling. "Our computer models now make it possible to successfully design, operate and control commercial-scale processes," he said. During the past decade, Dhurjati and a dozen research students at UD painstakingly broke down all of the steps in the termite microbes' conversion of coal to natural gas. They developed computer models, known technically as a "lumped kinetic mathematical model" and a "reaction connectivity model," describing each biochemical reaction as the termite microbial community transforms coal into cleaner fuel. Chemically speaking, the microbes—a mix of bacteria, protists and fungi—first convert the coal into large polyaromatic hydrocarbons, which are further degraded into mid-chain fatty acids, next into organic acids, finally producing methane. The kinetic model simplifies and "lumps" the hundreds of steps into a few important intermediate ones. These biochemical intermediates are then incorporated into a mathematical model that can be used to identify where the process breaks down and how to get it going again. Do the microbes need more food? Is the temperature optimal? The models serve as a quantitative tool, providing critical information for addressing the nutritional needs of the microbes and for troubleshooting metabolic bottlenecks and chokepoints. The models also can be used to simulate coal mine conditions, an environment very different from the termite gut. The microbe-based technology already has been implemented in large tanks called biodigesters above ground, and Dhurjati is now seeking collaborators to test the technology below ground, in a deep coal mine. "This groundbreaking biotechnology has the potential to change 'dirty coal' into 'clean coal,'" he said. "That would be a big win-win for the environment and for the economy." Coal currently accounts for nearly 30 percent of the world's energy supply and about 40 percent of its electricity generation, according to the Committee on Earth Resources of the National Academies of Sciences, Engineering and Medicine. While coal continues to be vital to the global energy supply, it also has a reputation for being dirty, dangerous for workers, and damaging to human health and the environment. Burning coal releases toxic pollutants into the air, such as mercury, sulfur dioxide, nitrogen oxides and soot, contributing to respiratory illnesses. Coal also is notorious for generating more greenhouse gas emissions when burned than oil or natural gas. It generates almost twice as much carbon dioxide per unit of energy than natural gas. 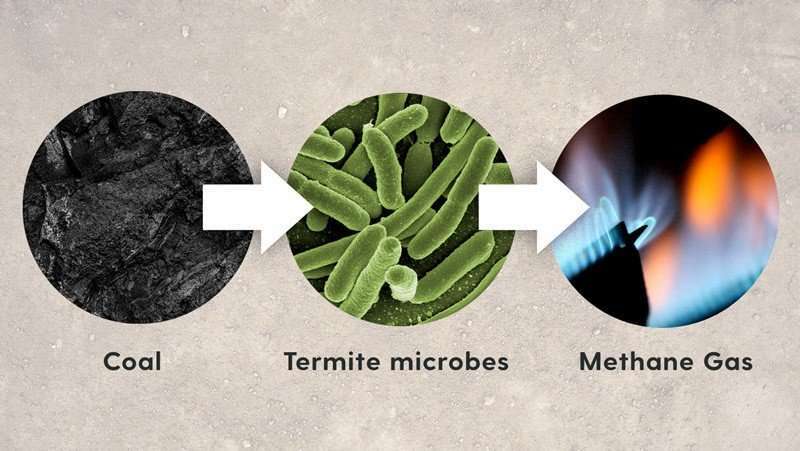 Instead of burning coal, Dhurjati wants to use termite-gut microbes to digest it, releasing natural gas. "This would make coal-based energy much, much cleaner until the world has time to completely switch over to renewables like wind and solar," he said. The world has an estimated 1.1 trillion tons of coal—these are reserves that are able to be mined with existing technology, according to the U.S. Energy Information Administration. That quantity is estimated to last about another 150 years under current production rates, the World Coal Association said. China and India are the biggest consumers of coal, and the United States has the largest proven coal reserves. 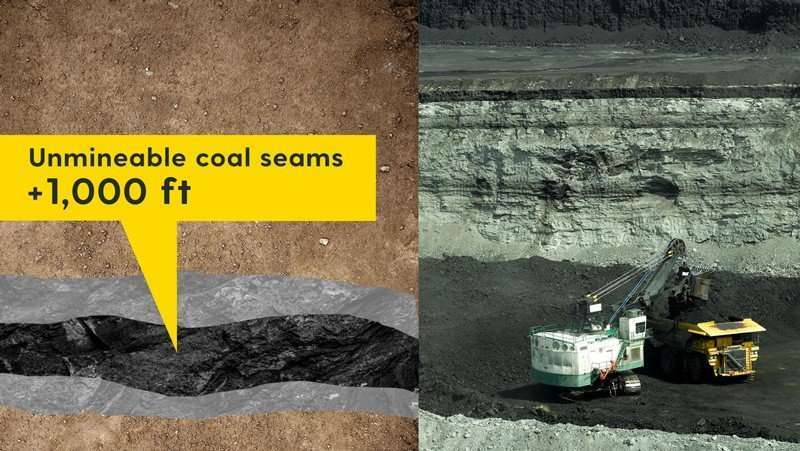 Yet less than 5 percent of the world's coal is considered "mineable." According to the U.S. Energy Information Administration, 90.7 percent of all the fossil fuels worldwide lie in deep, unmineable coal seams, followed by mineable coal at 4.8 percent, natural gas at 2.3 percent, and oil at 2.2 percent. The vast majority of coal is locked up underground in seams 1,000 feet or more deep—equivalent to three Statues of Liberty stacked on top of one another and then some. In a process called coal-bed methane extraction, which has been supported by the U.S. Department of Energy since the 1980s, holes or "wells" are drilled from the surface to underground coal seams to access methane trapped ages ago when the coal was formed. Several U.S. states, as well as Australia and India, use this method. Dhurjati said he hopes to deploy microbe miners at one of these sites to feed on the coal and produce a steady flow of natural gas, piped to the surface. "ARCTECH has the microbes and technology, and our computer models have helped us uncover key factors and limitations that previously impeded commercialization of the technology below ground," he said. "The technology is ready to go." Dhurjati considers coal "an equal opportunity resource." 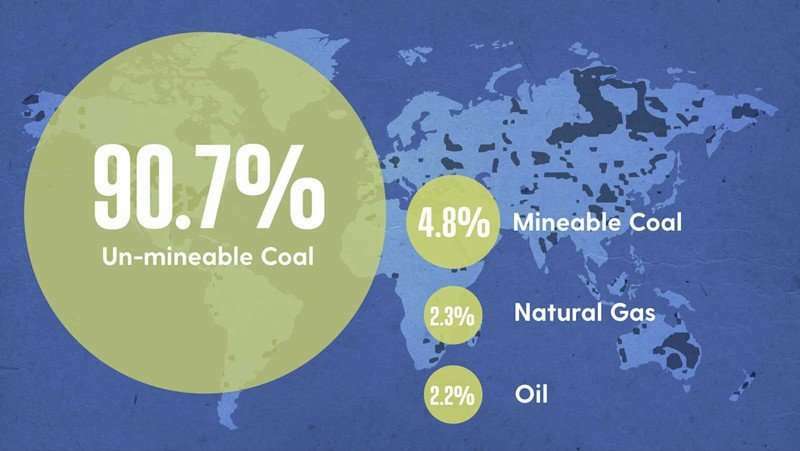 Although the United States harbors the world's largest supply, more than 70 countries have coal resources. "Our goal is to help countries use coal in a safe, clean way, as the world continues transitioning to renewable energy," Dhurjati said. "This is one of the most important projects I have ever been involved in, and it has the potential to be a real game-changer." Abhilash Sharma, a UD senior majoring in engineering from Marietta, Georgia, and the first author on the paper, volunteered to do research on Dhurjati's team when he was a sophomore and has continued ever since because he said he believes so deeply in the work. "Coal is so incredibly abundant that it would be wrong to ignore it," Sharma said. "We're moving toward a new mindset where rather than sending people underground, we'll send microbes underground and leave the people above to deal with what the microbes bring out. In doing so, we would give people a lot more skills toward future jobs as well."